In the midst of U*Space’s colorful walls, paintings and books, a line of black and white photographs hangs like a shade against sunlight. U*Space’s founder and curator, Terence E. Jackson, selected the photographs from his collection of press images reaching back to the 1940’s. They mainly show African-Americans in the midst of intense conflict with whites. One might sum up the exhibit by saying these are civil rights movement photographs. 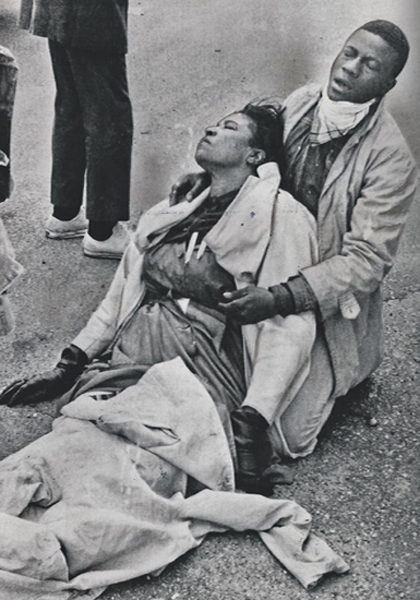 However, Jackson selected these images in part because of the inspiration he found in seeing the ordinary people who carried out the struggle. It can feel very limiting to refer to the “civil rights movement” when you’re looking at some of these pictures of people and places you’ve probably never heard of before. For example, there’s an image on display of a black teenage boy standing up to a white teenage boy who thinks he can dictate who uses the sidewalk. The first boy is pointing a defiant finger in the second boy’s face, while the first boy’s sister stands slightly behind and between the boys. She seems to be looking straight into the camera. That’s all there is inside the frame–three children. One reaction is, “There’s no ‘movement’ there.” It’s just a fight. Even if the white boy is motivated by racism, and even if the black boy is motivated by anti-racism, what you see is a fight. That means the heat of aggression, the danger of injury and humiliation—all of the things that anyone experiences when doing battle. The directness of the confrontation in this image seems to make the history that’s at issue more present, more palpable, more stomach-turning. Of course that fight had a context. It’s an image from 1958 in Little Rock, Arkansas. That was the year after the Little Rock 9 enrolled in a high school that was segregated. No wonder the mainstream newspaper photographers had this unique subject matter that sometimes won photojournalism awards: they were pointing their cameras at children going down the sidewalk. Otherwise we might wonder why a street fight was newsworthy. That picture is one of the few in this collection that identified by name a person captured in the picture. The black boy was identified as Johnny Gray, age 15. The white boy was not identified by name. Do you wonder why not? Jackson points out another aspect of the courage that is frequently on display in these pictures of police fights and sit-ins and national guard arrests: The African-Americans being photographed lived in the places where they were fighting. These are not pictures of national leaders who were making news by visiting civil rights hot spots. Johnny Gray most likely lived in Little Rock. His sister was probably looking into that camera thinking that her picture might be in the paper and identified by readers as a resister to white supremacy. What individual courage would she have to summon? Who would be available to assist her in fighting off attackers? It’s distressing to see a couple of rooms full of pictures of white police and national guardsmen fighting with African-Americans. White people’s hatred is made plain here. A club rammed up an African-American man’s crotch. A bulldozer preparing to run over a protester lying prone before it. A policeman swinging a club with great determination to inflict injury, while his own face registers a flinching from the violence. These are ugly facts of our history. In fact it seems like a history exhibit, with these black and white photographs accompanied by newspaper reporting. So why does U*Space display the exhibit in an art gallery? The simple version of Jackson’s impassioned answer is that, as a curator he is inspired by the struggles and courage and victories of ordinary people. He says he enjoys the fantastic that is found in art, but that reality is a thousand times more brilliant. “Seems Like I Done Had To Fight My Whole Life” – Reflected Imagery of the African-American Struggle for Respect, at U*Space Gallery on Edgewood Avenue through February 24, 2013. This entry was posted in Art in Atlanta, Uncategorized and tagged Galleries, Photography, Terence E. Jackson on February 21, 2013 by Bryan Alexander.